Are you ever inclined to show no restraint when ordering a pizza with your own selection of toppings? To go for everything that you like, rather than just three or four complementary flavours? The staff at Golden Pizza have done just that with one of the gourmet pizzas on their specials board, the aptly named 'Fusion'. It features: three types of tomatoes (the standard tom base, sun-dried and roma), two types of cheese (mozza and bocconcini), three vegetables (eggplant, roasted peppers and pumpkin) plus a meat (Virginian ham). Golden Pizza's standard base is a lot thicker than many, so it can handle the overload. And so can my tastebuds. This pizza was delicious. The thicker base is fluffy on the inside with a crisp base, and not too sweet. There wasn't huge evidence of the sun-drieds, but the romas added juicy bursts of tomato flavour. I think pumpkin is a natural fit as a pizza topping, but perhaps its preparation needs dictate the fact that it's not always popular. Here it was wonderfully mushy against the crisper base. My goodness, there are still so many flavours to describe! Both the eggplant and roasted peppers added their own degree of smokiness. The eggplant, happily, was finely cut so it didn't 'string out' as can be the case when it's laid on in larger slices. The Virginia ham contributed some subtle meatiness much as bacon might. All in all, I was thoroughly impressed. 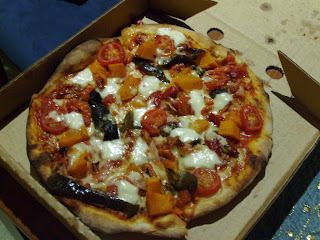 SG did in fact construct his own pizza. Ordering from the everyday menu, he went for the chicken pizza, which invites you to pick your own accompaniments. His choices were capsicum and mushroom, with the requisite BBQ sauce. The chicken pieces were chunky and as such dried out a little in the oven. This pizza was perhaps more akin to something we'd be likely to rustle up in our own oven, as far as the toppings went in any case. 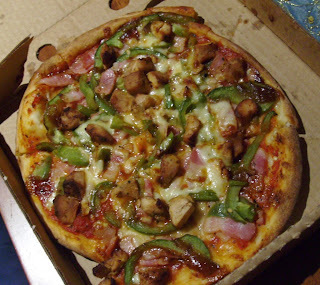 But the proof for any pizza establishment is in the base, and Golden Pizza have a lot to lay claim to in that regard to make them well worth the stopover on the way home.